Recently I have been asked how I make my fabric stamps and I thought I would put together a quick step-by-step process to show you some of the tricks I use for these cute little things that can make a wonderful addition to any sewing project. This idea is not new and it's not mine. 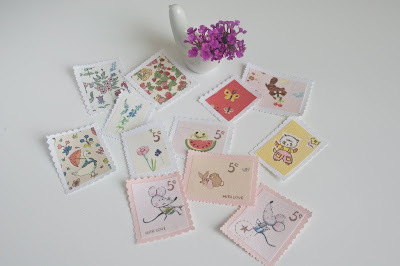 I came across these stamps years ago and really loved this concept. 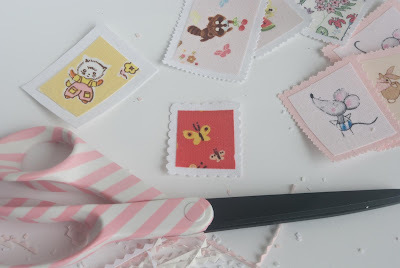 Over the years I worked out a way of making the fabric stamps that suited me and the tools I use. Hope you like it and find it useful. Let's begin! 1. Press well all the fabric scraps and the large piece of cotton that they are crease free. 2. Apply the fusible web to the back of the large piece of solid colour cotton according to the instruction. 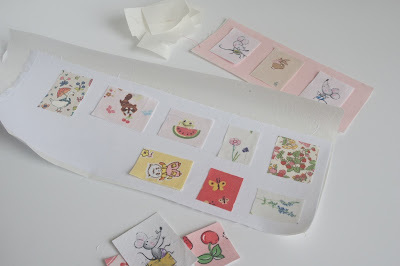 Take another large enough piece of fusible web and arrange all the fabric scraps on top close to each other. Place a piece of baking paper on top and press with a hot iron without steam. The baking paper helps keep your iron from sticking to the fusible web. 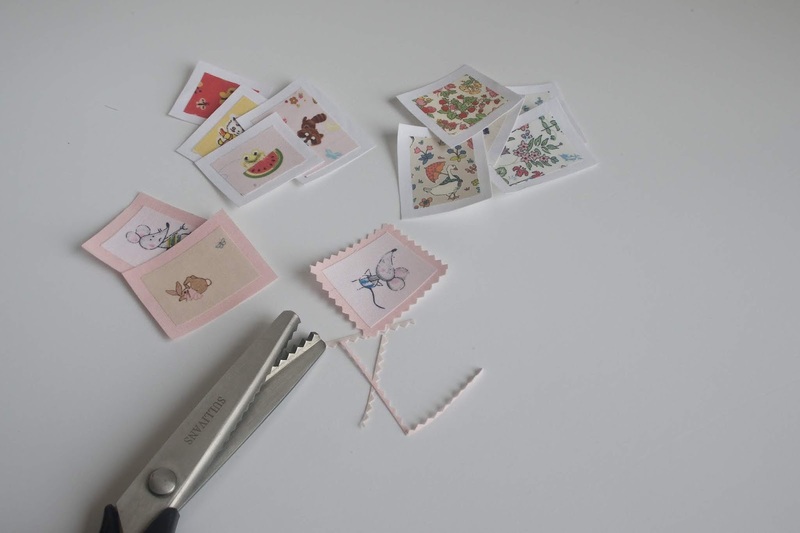 Peel the baking paper off and roughly cut out all the small pieces using your craft scissors. 3. 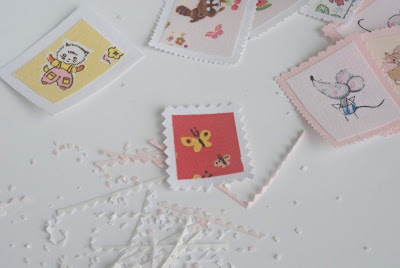 Using a small ruler and a rotary cutter, trim all the pieces into small rectangles and squares, depending on the print making sure to leave a little bit of room around the edge for stitching. You do not want to stitch on cute prints. 4. This step is best done on your ironing board so you won't have to move the paper. 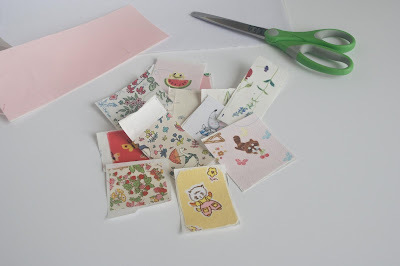 Very carefully remove the papers from the back of the pretty scraps. 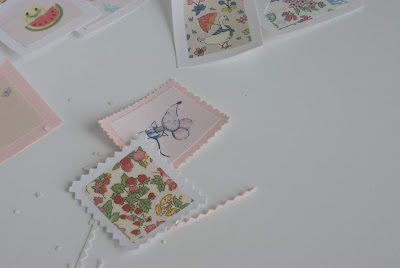 Make sure not to pull hard to prevent the stretching of the fabric and fraying of the edges. The back side is going to be a little bit sticky, that will help keep pieces in place. 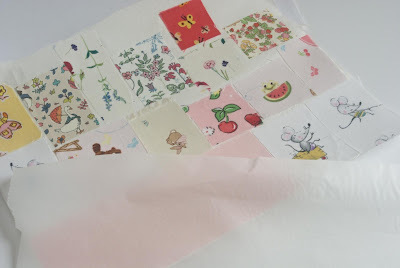 Arrange all the pieces on top of the solid fabric leaving about 1/2" between the pieces. Press well with a hot iron. 5. Roughly cut out the stamps. Trim all the pieces using your rotary cuter and a small ruler. 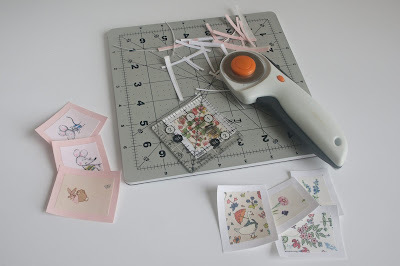 Leave a 1/4" border around all four sides. Leaving this wide border lets you fix up any mistakes made during trimming later on. 6. I have a pair of really large pinking shears so the zig zags (small triangles) are too big for my liking. I cut on all four sides once and then I cut one more time, snipping right in the middle of each triangle. You can see the difference in size and pattern in the photo below. The smaller zig zag looks much neater. There is another way to do this. Trim the edge with your large pinking shears once and then use your scissors to trim the pointy ends. Here you go. 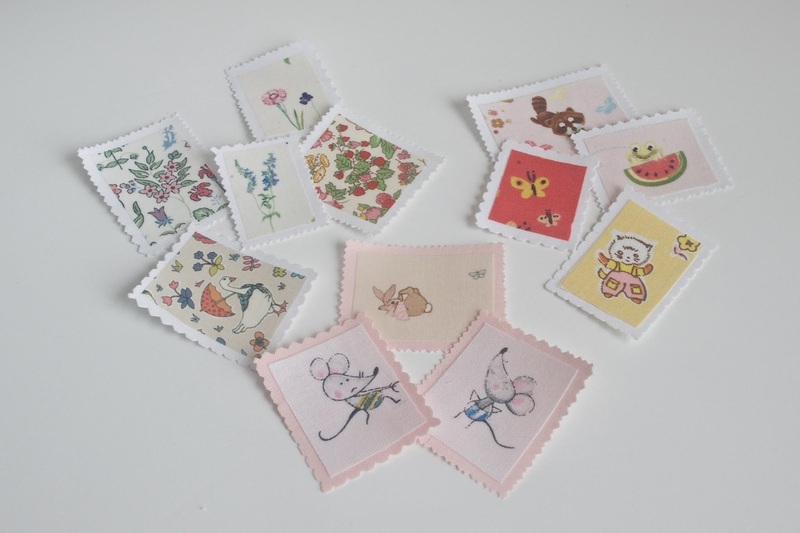 Plenty of cute fabric stamps to use in your amazing sewing projects! Thank you for this lovely tutorial. 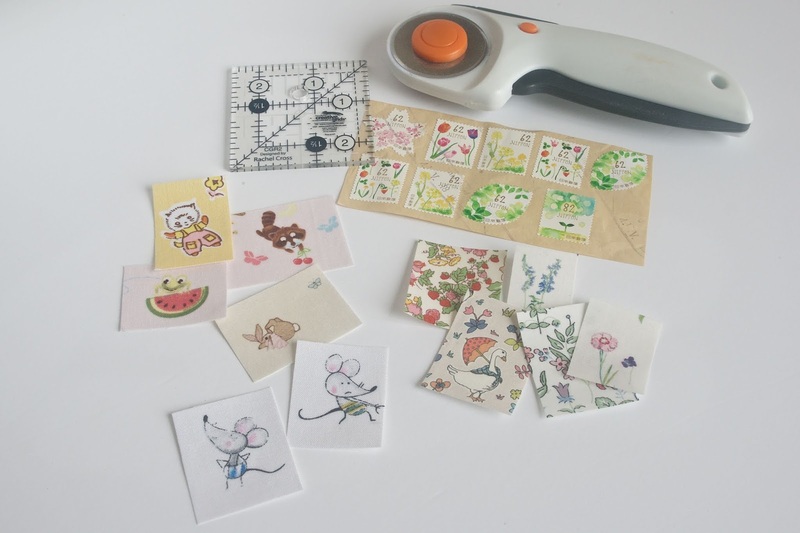 I love your little stamps and I had never thought of using baking paper to save my iron! I'm excited to read how you make these precious little stamps! Thank you for the terrific tutorial! Such a cute tutorial Larisa! Thanks for sharing your ideas! Thanks for this tutorial! Your stamps are so sweet and I love the little rubber stamp that you made, how clever! You are very welcome! Thank you for stopping by! Lovely tutorial. Thank you. :) You mention leave room for stitching. Is that if we wish to stitch the stamp onto something else?